I like designing and building things, so I decided to try to design a boat that I could build in two days with indigenous materials sustainably sourced near the headwaters of the Mississippi (you know – Home Depot in Minneapolis) and a few hand tools. I failed miserably – it took me six days and $230 in materials to build the prototype – but it is actually a pretty nice boat. I wanted something that would carry a payload of about 300 lbs. and with a cockpit that I could sleep in. The boat I designed is just over 15′ long – the maximum length using two standard sheets of plywood scarfed together. It has a maximum beam of 18″ at the keel and 24″ at the shear. The cockpit is 6′ long. There are four bulkheads and four watertight compartments – two with access ports for storage. 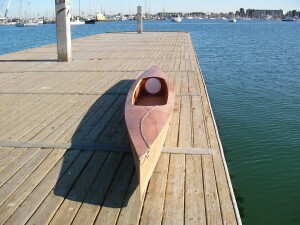 The boat has a flat bottom for ease of construction and flared sides to add some stability. The prismatic coefficient is 0.57 and the theoretical maximum hull speed is 5.2 kts. 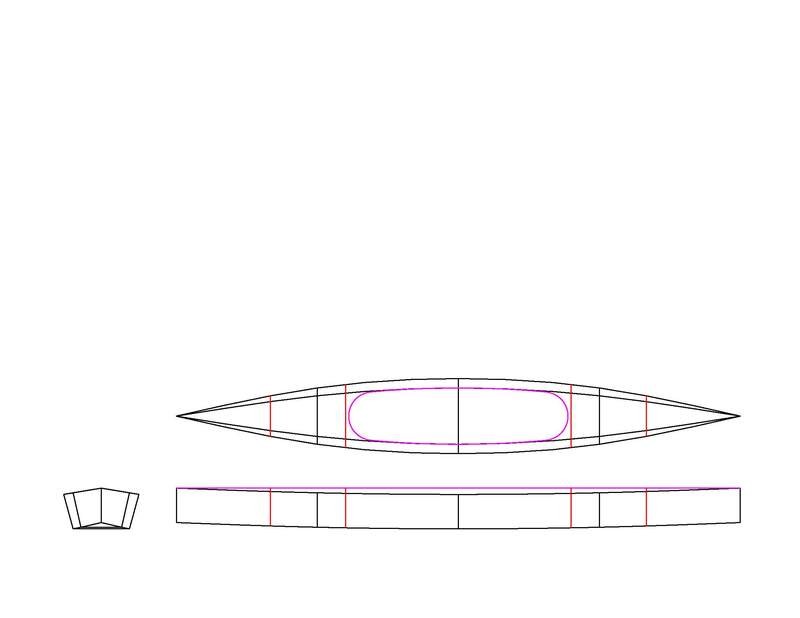 The boat is symmetrical about two axes, so four half side panels can be cut at once, two half bottom panels are cut together, and the same for the deck panels and bulkheads. 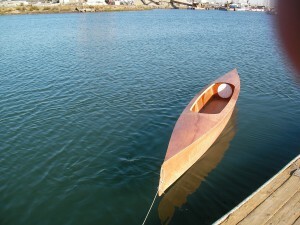 The boat is similar to a kayak, with a deck and narrow beam, but it has tall sides like a canoe. 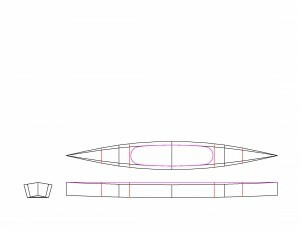 The build plan was to use 3 sheets of 1/8″ luan plywood (one sheet for the four half side panels, one sheet for the bottom, and one for the deck), 1/4 sheet of 1/4″ plywood for the bulkheads, 5 yards of 6 oz. fiberglass cloth, and a gallon of polyester resin. I did use the cheap luan plywood from Home Depot ($10 a sheet), but i used epoxy instead of polyester because I find it to be less gruesome to work with. The epoxy and a few odds and ends (two inspection ports and wood for the shear clamp and deck beams for the most part) blew the budget. Waiting for epoxy to dry blew the schedule. The hull went together quickly. I cut all the panels and scarfed them together in just a couple of hours. I also epoxied the two sides together at the bow and stern at the same time. That way, I could just pop the bottom between the sides, temporarily duct tape everything together, fillet and tape the joint, put a coat of epoxy on the interior, attach the bulkheads, and the hull would be almost done. That worked according to plan and only took a few hours, but then I had to wait for the epoxy to dry. 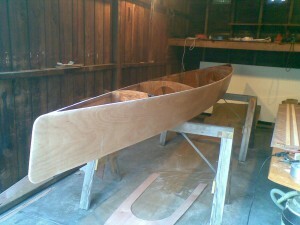 The next day I fiberglassed the exterior of the hull, and then had to wait a day for the epoxy to dry. Then one of the shear clamps broke and I had to wait another day for the epoxy on the repair to dry. After six days the boat was finally complete. 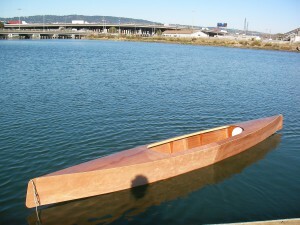 I’ve taken the boat out once for a short paddle on the Oakland Estuary. With no load besides me it is less stable than I would like it to be. The sides are high (11″ at the cockpit) so I need to sit on a 2″ pad in order to paddle comfortably, which adds to the stability problem. I hope 100 lbs of gear will make it less tippy. It tracks really well and it seems to move along at a good clip with little effort. I didn’t have my GPS so I don’t know how fast it is. I was worried about the strength of the hull (the Home Depot luan plywood is really crappy – I wouldn’t use it again)but it is really solid. So at this point I am cautiously optimistic that I could build a kayak on-site for a Mississippi River trip. I think I could get the build time to four days, and the cost would be about $300. If the stability improves when the boat is loaded, the design will be ideal. Otherwise I’ll add some beam and perhaps a v-hull to improve stability.